Twitter is taking some time to refine its power-users’ beloved TweetDeck, but its efforts to consolidate the platform may leave some bitter feelings. In a blog post released today, Twitter announced a new one login system for the browser, but will also no longer support a stand-alone Windows app. “We’ve been working on infrastructure projects like this to ensure we have a stable foundation to continue improving TweetDeck in the future,” the blog post said. The new log-in system sounds a little complicated, but it’s more of an invisible improvement to accessing TweetDeck from within the browser. Previously, users always had to log in separately on the TweetDeck page, even if they were already signed in to the Twitter client. In a feature rolling out within the coming weeks, that will all happen automatically. Additionally, if you use Chrome, there’s now the option to pin TweetDeck to your taskbar for easy access. 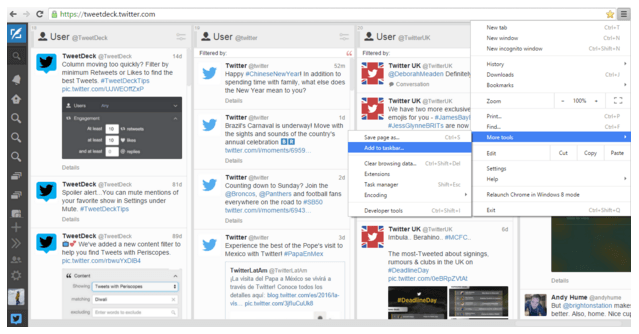 Now for the not-so-great news: Twitter will no longer support the TweetDeck Windows app beginning April 15. If users want to continue to receive updates to the platform, they will need to switch to the browser-based app.